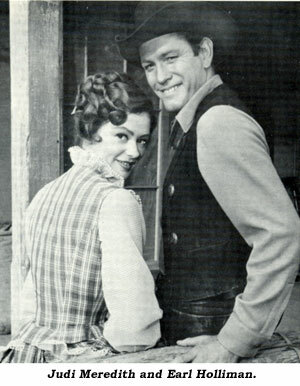 Do You Remember... "Hotel de Paree"
Earl Holliman, probably best remembered for co-starring with Angie Dickinson on “Police Woman” in the ‘70s, was Sundance, the fast-gun half-owner of “Hotel de Paree” in Georgetown, CO, circa 1870. 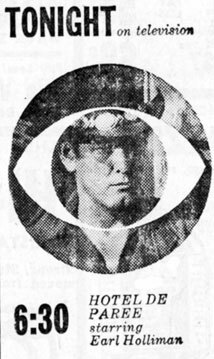 The 30 minute CBS series ran on Friday nights from 8:30-9pm (EST) from October 2, 1959, to June 3, 1960. Sundance returned to his hometown after serving 17 years in prison for accidentally killing a man. Upon his return, he found his Hotel de Paree being operated by a relative of the dead man, Annette Devereauz (Jeanette Nolan), as if she were still in France instead of the Wild West. Sorting matters out in the first episode, Sundance and Annette become partners in the hotel. They were joined in the 5th episode by Annette’s niece, Monique Deveraux (Judi Meredith), who arrived from France. Strother Martin as general store owner Aaron Donager was the only other regular cast member, unless you count Sundance’s constant companion, his dog Useless, who seemed to have the run of the Hotel de Paree. There seemed to be no official law in Georgetown, so Sundance’s fast gun was needed to keep things peaceful. Sundance’s trademark was not a gun, but a hatband of polished silver discs that he often used to blind his adversaries. Farfetched, yes, but producers were looking for any sort of gimmick to hook an audience with the proliferation of westerns on TV at the time. In the timeslot following “Rawhide”, “Hotel de Paree” should have done better in the ratings than it did, however, CBS never seemed to get behind the series and promote it. Opposite “M Squad” on NBC and “Man From Blackhawk” on ABC, Holliman’s series failed to catch on and was canceled after 32 episodes, replaced by “December Bride” reruns, and “Route 66” later in the Fall of ‘60. 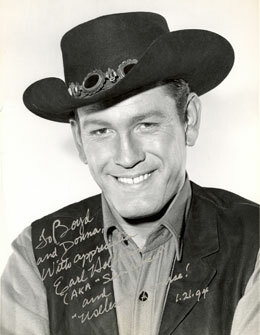 Holliman later starred in the rodeo series “Wide Country” on NBC in ‘62-‘63, but gained lasting fame on “Police Woman” and in films such as “Sons of Katie Elder” with John Wayne. Earl was born September 11, 1928, in the swampland near Delhi, Louisiana. His father died before he was born and Earl was adopted by the Holliman family. Quitting school at 14, he hitchhiked to Hollywood at 15, but when his money ran out he returned home and entered the Navy. When they learned his true age, he was booted out and sent home where he completed high school. Graduating, he re-entered the Navy. Upon his discharge he studied drama at Louisiana State University, then U.C.L.A. on his G.I. Bill. After joining the Pasadena Playhouse, he made his screen debut in ‘53. 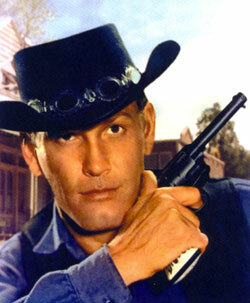 Strother Martin was born 3/26/19 and died 8/1/80. Jeanette Nolan was born 12/30/11 and died 6/5/98. From Portland, Judi Meredith was born 10/13/36 and left acting in the early ‘70s, her current whereabouts unknown. Whether it was the odd title for a western, the lack of CBS backing, or the competition, the life of a good series, “Hotel de Paree,” was too brief.